I know, they should be blue and yellow not orange but I had a 3 year old Granddaughter in the house with me at the time of making them…but I’m sure I used yellow colouring! Mix together all the dry ingredients in a bowl, the flour, sugar, baking powder, bicarbonate of soda and salt. In a separate bowl mash the bananas then add the vanilla extract, eggs and butter and beat well. Pour the wet mixture into the dry and beat until well combined. Pour into cupcake liners, I used blue as that’s the colour of the Minions trousers. Bake for 18 – 20 minutes in a Gas 4/175C oven. Make up a batch of butter cream, colour half blue and half yellow (unless you have a granddaughter helping ;-)) and pipe the butter cream onto the cakes. 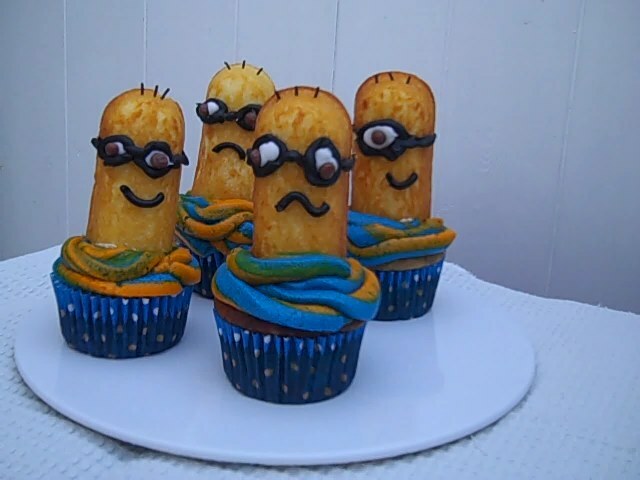 Cut the Twinkies in half and using the black icing pipe on the glasses and mouths, pipe the white icing into the glasses then add a chocolate ball to each to make the eyes. Gently push a few chocolate sprinkles in to make the hair.